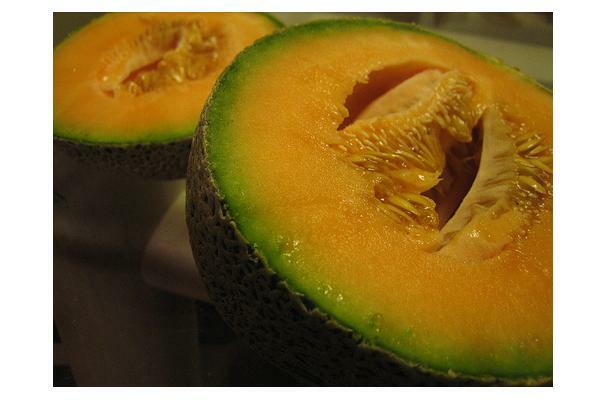 Cantaloupe is a type of muskmelon of which there are two varieties, that originated in Africa and India. This fruit grows on a vine that runs along the ground and belongs to the same family as other types of melons and squash. The two varieties of Cantaloupe are European Cantaloupe and North American Cantaloupe. European Cantaloupe has a lightly ribbed, pale green skin while the North American Cantaloupe has a rock-like, reticulated light brown skin. The flesh is usually orange in color and moderately sweet to taste with a rich aroma. Inside the melon is a hollow cavity containing a web of flat seeds that must be removed prior to eating. Cantaloupe is low in calories and high in vitamins A and C. This fruit makes for a healthy snack and can be used in salads or made into a refreshing drink. Round fruit with textured skin. Tan on the exterior and pale orange on the interior. Choosing: To check if a cantaloupe is ripe, smell the fruit near where the stem was broken. Ripe cantaloupe will have a deep, sweet smell. Buying: Available Mid summer to late summer at farmer's markets. Available mostly year-round at most grocers. Consume the fruit within three days after cutting it open to reduce the risk of salmonella and other bacterial infection. Cleaning: Wash the cantaloupe's skin thoroughly before cutting. History: Native to India and Africa, cantaloupes were later planted by the Greeks and Romans. Christopher Columbus introduced the fruit to North America on his second voyage in 1494. Thanks for all that info on canatloupes dear!